On a trip recent trip to Cornwall, with the Neolithic Studies Group, we visited Carwynnen Quoit aka Giants Quoit. I was equipped with an inadequate scale for the recording task at hand. This monument, which ‘collapsed’ for at least the second time in the 1960s, is the focus of a remarkable and unique project, a community endeavour to rebuild the monument, develop the site and its surrounding landscape as an educational and leisure amenity, and create a sustainable monument for future generations to enjoy. 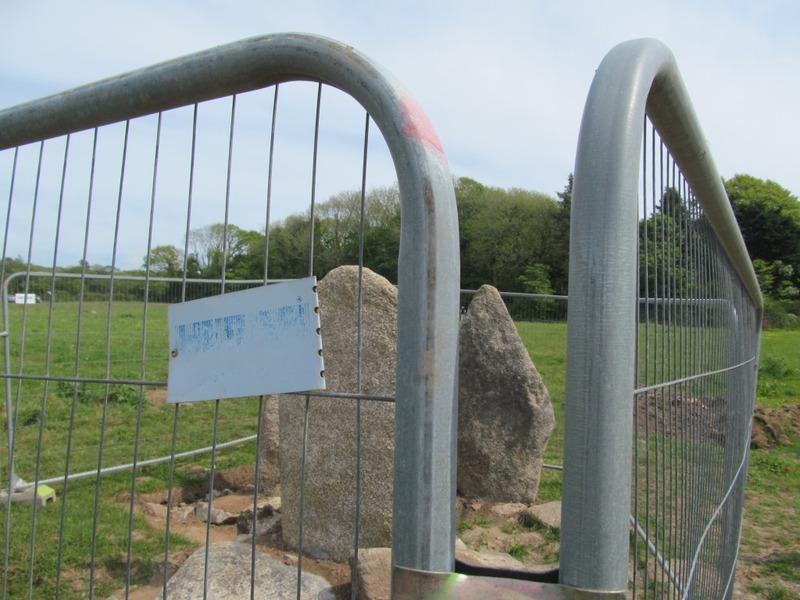 The project, run by the Sustainable Trust, is another great example of how (re)building prehistoric-style monuments today, in the modern landscape, can impact of social well-being. Far from being anachronistic and hopelessly lost in today’s busy complex world, megaliths seem to me to be as relevant as ever, bang up-to-date, even forward looking. The website for the project has huge amounts of information about the (pre)history of this monument, and I don’t want to repeat all of that here. 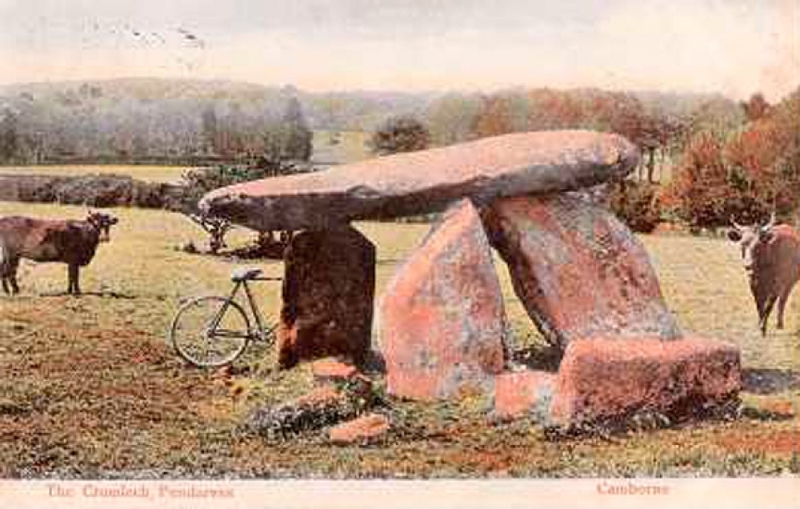 Suffice to say that this once magnificent Neolithic dolmen has had some ups and downs over the past two centuries. It fell down twice, once in 1842, the second time in 1966. After the first collapse it was re-erected by estate workmen with quite rudimentary tools. The second collapse it is claimed happened because of an earthquake, although no-one is quite sure what happened. Between the two collapses, the monument hosted the Cornish Gostedd on September 5th 1948. Reduced to little more than a pile of big rubble, the monument became even more obscure than it had been previously. The field that it sits in – Frying Pan Field – was in regular cultivation and the monument took on the appearance of field clearance. However, all of this changed in 2009 when the Sustainable Trust purchased the land around the monument with the help of a HLF grant and other supporters. Their aim? ‘To restore the monument and make it more accessible and develop sensitive long-term management of the monument and its landscape setting’. 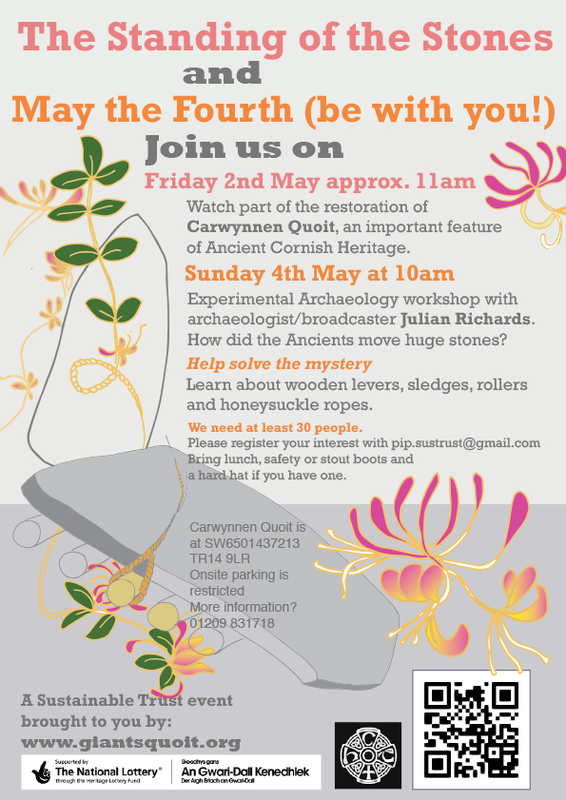 This has entailed a series of events and projects over the past few years, including workshops, excavations, laser scanning, talks, pop-up exhibitions, engagement with schools and a stall about the project has turned up at loads of Cornwall events. The focus has not just been the monument, but also the ecology of the surrounding landscape. Poetry and music have been composed and performed at the monument. 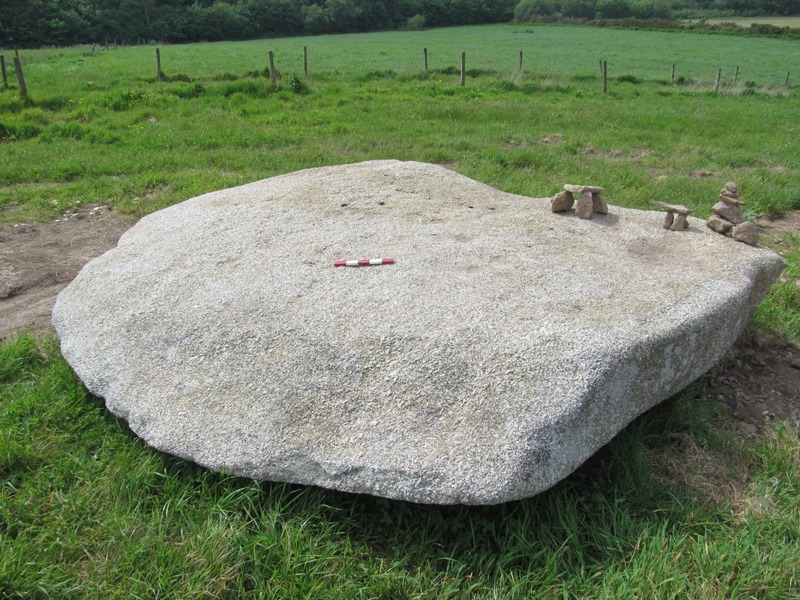 Hundreds of people have been involved in this project in a whole range of different ways, and crucially I think the focus has not just been on what happened in the distant past, but also the relevance and role of the dolmen for people today and into the future. Even TVs Julian Richards has got his hands dirty helping out (proving that he is far more than a grizzled Richard Branson look-a-like). 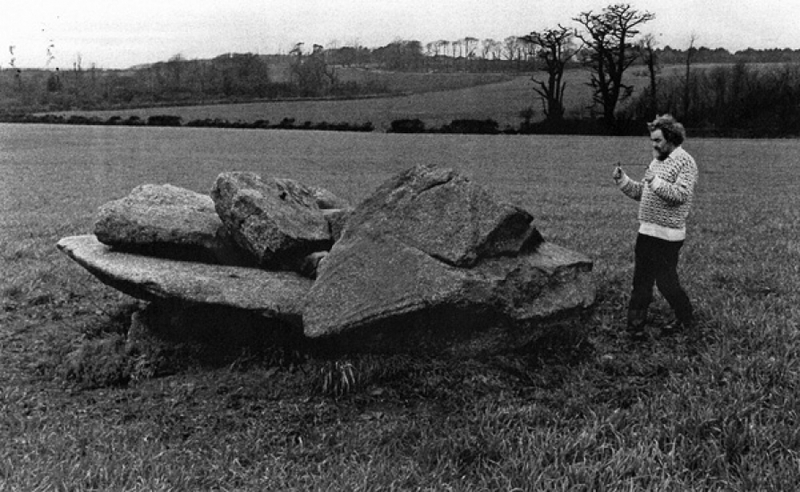 Perhaps the major focus, though, has been the ambitious project to reconstruct the dolmen. This has taken a staged approach, which will conclude with the lifting and placing of the capstone on the support stones on the summer solstice this year. The modern day megalith builders make no bones about the inauthentic way this will be done – using a big machine – but as with the Crieff timber circle, this isn’t about mimicking prehistoric processes, it is about creating an impact, an effect, and leaving a legacy that isn’t just dozens of team members with sore backs and rope burns. 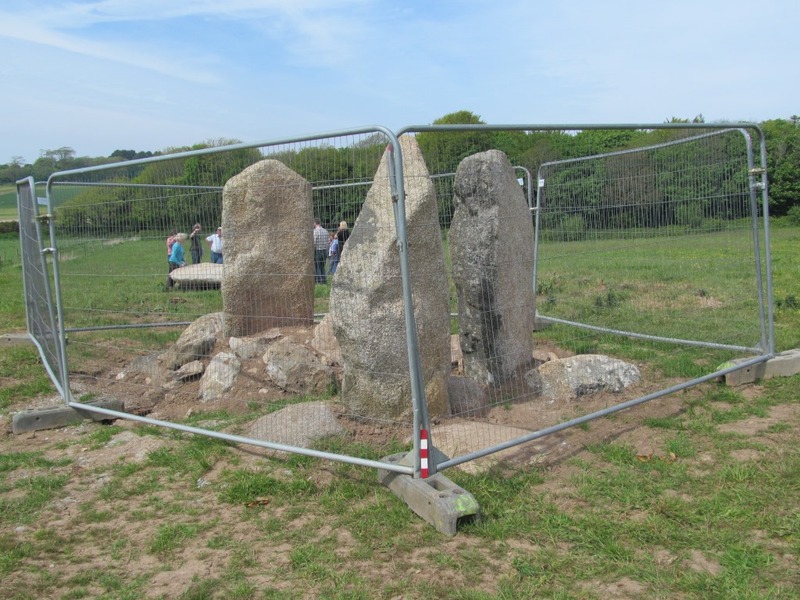 Already, the three supporting standing stones have been re-erected, a combination of machine work and worker hours. The uprights have supporting stones at their base, but it is hoped once the stones bed in (and have a capstone pressing down upon them) then these can be removed. These erection events were very much public spectacles, memorable events. Our visit to the monument, then, took place just a month or so before the much anticipated capstone placement manoeuvre, and the excitement and trepidation of our guides including Andy Norfolk of the Trust was quite literally palpable. We viewed an interesting wishing-well noticeboard, which on one side had posters etc pinned on advertising events past and future. Visible at the far end of the field was the bizarre sight of three closely clustered standing stones sitting within a fenced off area, and beside that two massive recumbent stones, one of them the capstone. 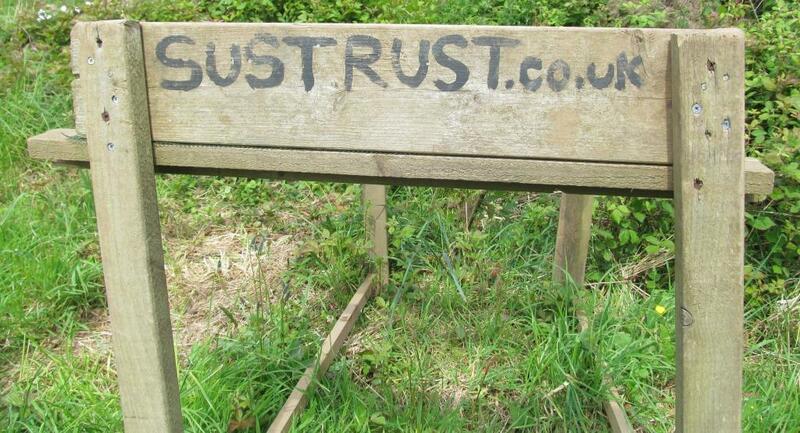 As we walked down through the field, we passed some benches in a circular arrangement, a story-telling area. The capstone was adorned with miniature dolmen made from small stones, much more suitable for my tiny scale. 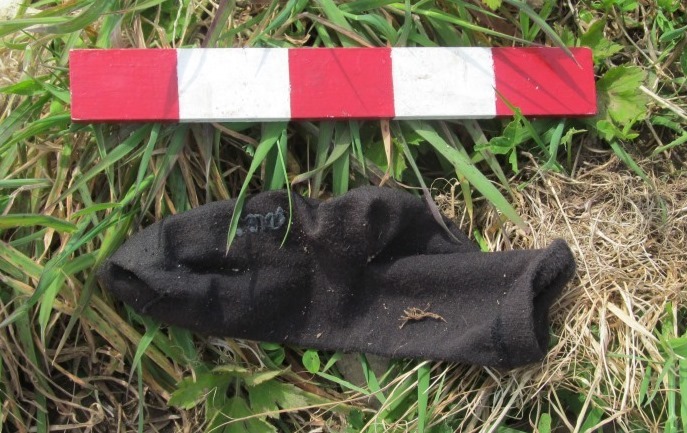 And between the capstone and monument lay a small black rather damp looking sock. And then there was the caged beast itself, the dolmen in waiting, the stones themselves trembling with anticipation of their requirement to once again sustain the huge capstone. 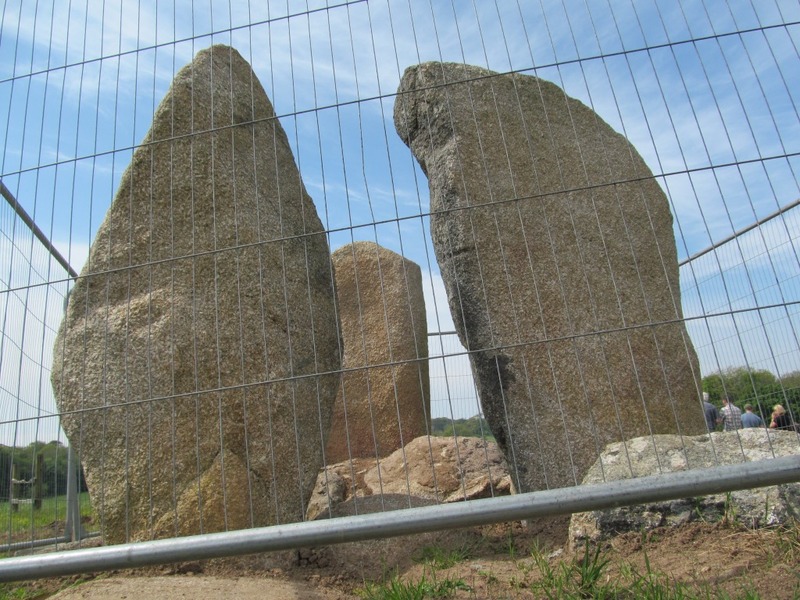 This is a fantastic project, and one that demonstrates the potential social, ecological and even economic benefits of megalith construction. The ostensibly simple component parts – large boulders essentially – come together to form something magical, a structure that has great appeal to the press and appeals even more to the public imagination. The numbers of volunteer hours, the effort expended to get this far, are evidence of the passion and potential this project is generating. I wish the team well in the final push and look forward to visiting the third iteration of this monument and hope that this can inspire a new wave of megalith building. 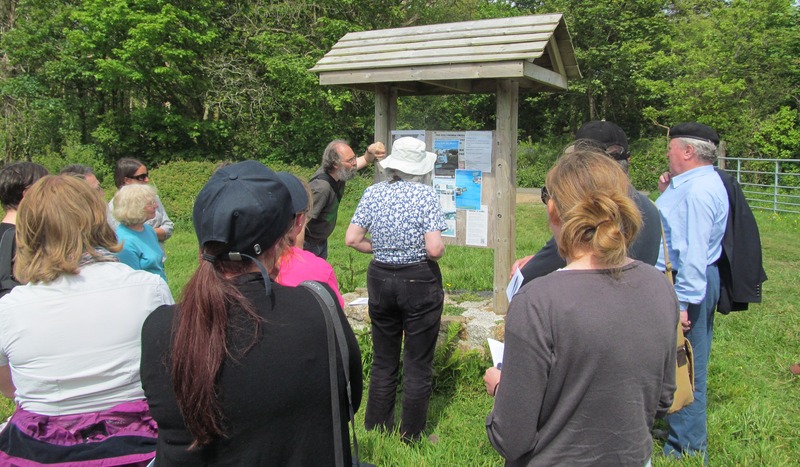 Sources and acknowledgements: thanks first and foremost for our guides at the Quoit, and also for Jenny Moore for taking us along in the first place. Much of the information in this blog has come from the leaflets we were handed on site, and the project website (link in post above). Three of the images above also came from this website – the old postcard, the dowsing image and the event poster. 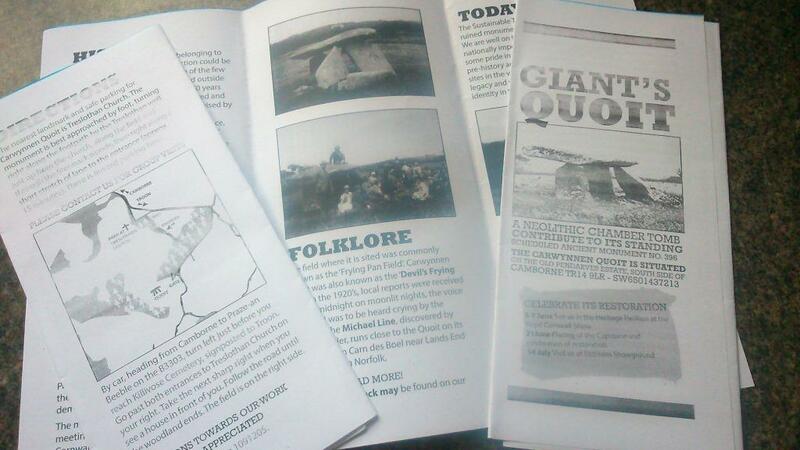 I would encourage you to follow progress via twitter @giantsquoit and see these other links. The definition of sustainable development at the start of the post was written by UN’s 1987 Brundtland Commission.